Truro City manager Steve Tully says his side is improving steadily after they beat St Albans City 2-0 on Saturday. 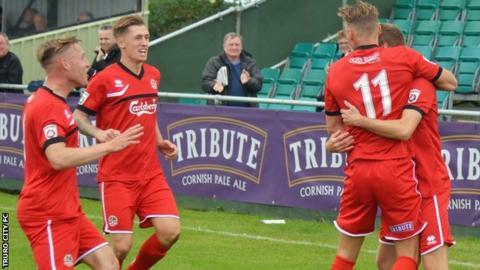 The win was Truro's first in five games as they start to adapt to life in the National League South. Connor Riley-Lowe scored his first goal since joining on loan from Exeter City to set Truro on their way before his former Exeter team-mate Aaron Dawson made it 2-0 after 25 minutes. "We're slowly building in the right direction," Tully told BBC Cornwall. "The squad's evolving, we're building brick by brick and at the moment we're stopping teams scoring goals and that's a good sign." City had drawn 0-0 with Eastbourne Borough in their previous match, having lost 6-0 to Oxford City and 3-1 to Gosport Borough over the Bank Holiday weekend. "The six-goal massacre here saw a few home truths told, but both myself and Wayne (Carlisle, Truro's assistant manager) looked at ourselves and made sure it started from us, but the players have responded brilliantly," added Tully. "To grind out two clean sheets, take four points from the last two games, we're really pleased."